Asagaya House (Tokyo)-a highly evaluated achievement of modern housing architecture in Japan. It was developed and built by Japan Housing Corporation in 1958 and is known as a masterpiece of house for the suburbs, designed by the leading Japanese architects in post WW2 years. Asagaya house, designed with their advanced and liberal concepts, has long been loved by not only the residents and the neighborhood but many others and is now being under re-development due to aging of both building structure and its residents. 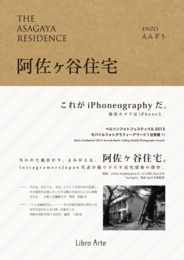 Photos in this book were selected out of thousands taken by ENZO- the representative of Instagramers Japan, one of the largest photo communities in Japan. The photos were taken, with owners’ approval, for several months from the moving-out phase through right before the demolition phase. The book also carries the series of photos that gained the first prize at Berlin Calling- Mobile Photography Award 2013. The capital was raised through Crowd Funding program. This book should be surely unique in this sector as it is the only photo book which features Asagaya House and has been processed only with iPhone5 from photo shooting through final editing-iPhoneography. The scenery gone has now returned to stay in this book.